When will the ASCANS be Announced? The question we're all eager to have answered is when will NASA announce the 2009 class of astronaut candidates. The Astronaut Selection Office's timeline has listed "April 2009" as the timeframe for the announcement since it was originally posted in October 2007. Since about mid-2008, all indications from NASA were that the announcement would be in May rather than April 2009, and that is how I reported it in the updated timeline that I compiled. June 8 update: NASA has updated its timeline and now says the new astronauts will be announced in June 2009. This likely supercedes the speculation presented below that the announcement may take longer. Note that I fixed a typographical error in the paragraph above that said August but was supposed to say April. Until recently, I thought May was going to be the big month for new astronaut announcements, with Europe, Canada, and NASA releasing their picks. Indications now are that the names of the selectees will be released later. How much later is open to some speculation. Over the past couple of weeks, rumors have surfaced that NASA plans to make the big announcement sometime in June. I hope this is the case, but some recent developments lead me to question whether the big news will slip even further behind schedule. To recap, the delay has already slipped from April to at least June 2009. On one hand, it is in NASA's best interest to make the announcement soon so that the medical tests done on interviewees don't become stale. However, economic and political forces may win and force the selection to be delayed a few more months. A knowledgeable source who reads this blog pointed out that the House has frozen NASA's budget for human space flight pending an an outside review of the agency's post-Shuttle era plans. A post on spacepolitics.com showed how NASA's Exploration budget was cut significantly from the $3.96 billion requested by the President to $3.29 billion to maintain a level FY09 funding level in FY10. A statement by Rep. Alan Mollohan (D-WV) outlined a blue ribbon panel that will review the current vision for human space flight as a "time-out to allow the President to establish his vision for human space exploration and to commit to realistic future funding levels." In light of this current freeze on NASA's human spaceflight budget, a pending outside review of the agency's plans for replacing the Space Shuttle, and the forthcoming confirmation of a new NASA administrator, it may be unrealistic to expect the announcement of a new astronaut class until the panel has had a chance to at least start its work. One could take the position that it would be unwise for NASA to go ahead with its plans to hire new astronauts now in the midst of this uncertainty. I hope my source and I are wrong about this because I, for one, am very eager to hear the announcement. Thanks to this blog, I've gotten to know some of the (now 37) finalists, and I'm rooting for all of them. The blue ribbon panel charged with helping chart the future of NASA's human spaceflight program is being called the "Augustine Human Space Flight Review Commission" after retired Lockheed Martin CEO Norm Augustine who will head it. One of the confirmed members of the commission is Astronaut Leroy Chiao, and you can chime in on your views on the future direction of human spaceflight on his blog. The Orlando Sentinel has released an unofficial list of the other commission members, and it seems to be an impressive bunch. June 5 update: In a press release earlier today, NASA announced a website inviting the public to make its voice heard to the Review of U.S. Human Space Flight Plans Committee. You can even follow the committee on twitter. Maybe this won't be a long process after all, and perhaps the astronaut announcement will happen sooner rather than later. For some lighter reading, take a look at Leroy Chiao's witty and enlightening recent blog post about life in space. 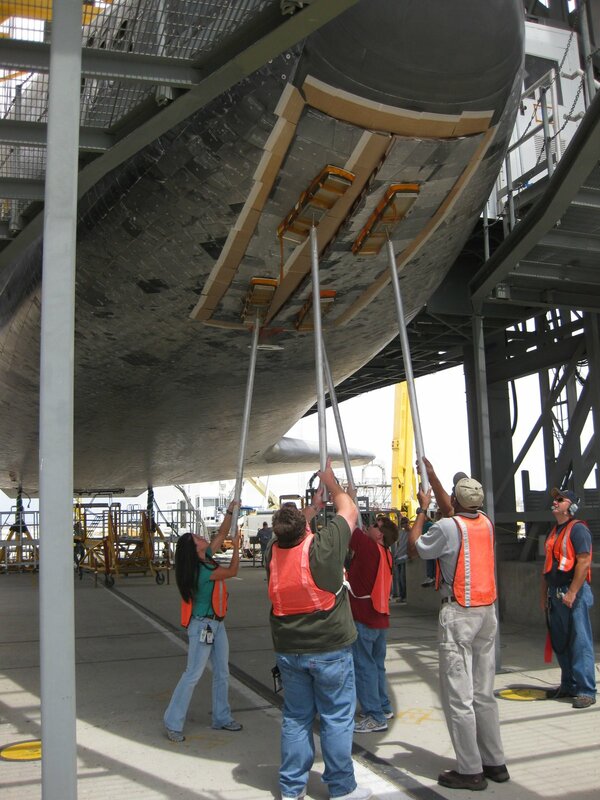 Also, fellow astronaut hopeful Damaris Sarria has had several blog posts with pictures this past week during her trip to California to help inspect the Shuttle Atlantis and prepare it for its flight back to Florida on the carrier aircraft. She got to help close the Shuttle landing gear, pose next to the Atlantis cockpit, go inside the 747 carrier plane, and sit in its cockpit. Long time readers of this blog know I'm a fan of the Japanese Kaguya lunar mission. I've blogged about it three times (1, 2, 3). Sadly, the impressive mission is going to come to an abrupt end on June 10, 2009 when it strikes the Moon in a controlled impact. More details on the time, location, and other details of what to expect with the impact are here. I may write a separate blog post on this in a few days if I have time, but I wanted to let everyone know about the IEEE Spectrum magazine Special Report on Why Mars? Why Now?. It's chock full of some really great articles, slideshows, and podcasts about the need for human missions to Mars. Many of these articles dovetail nicely into my summer adventure at FMARS. Finally, I'd like to wish everyone a happy World Environment Day (WED). WED has been celebrated on June 5 each year since 1972 and is one of the main ways the United Nations stimulates worldwide awareness of and action for the environment. Confirmed announcement to be made next week - 10 people. I have a very close friend that was a finalist for NASA astronaut...Calls went out on last Monday (June 22nd 2009) for the announcement. 9 new astronauts out of a finalist group of 47. To give you an idea of the statistics, this is the 20th astronaut selection class, and with nine members this will be the smallest US class size since 1969. I found your most excellent blog while looking for information about the 2009 astronaut class. My fingers crossed for your future prospects! I've got a video project involving african americans in flight (air and space) and would welcome any leads to, or contacts from, folks applying to NASA for astronaut slots or doing anything else interesting as a pilot. Please visit our site AeroSpaceNews.com and use the contact us form. Many thanks and best of luck to all!